So the festivities have ended. You have survived the barrage of water balloons, successfully withstood the swarm of gulaal smearing uncles, and ended up as a kaleidoscope of colours. Today, you will need no special filter for your display pictures. Tired, spent, exhilarated, your hair is a complete mess. It’s drenched, sticky, and caked in colour, you are reminded of the ordeal that awaits as you try to run your fingers through your locks. After playing Holi, the first thing you need to do is thoroughly rinse your hair with fresh water to wash off as much dry colour as possible. If you have oiled your hair, this should come off with less trouble. Once that is done, work some mild shampoo into your hair, and rinse it off with warm water. Try and avoid a second round of washing; it will dry out your hair excessively. Instead, go for a natural hair rinse to remove the remaining color that is stuck to your scalp or strands. It will not just cleanse your hair thoroughly, but also tighten the outer layer of your cuticle & return your hair’s shine. 1. Mix 2 tablespoons apple cider vinegar, juice of half a lemon, and 1 cup of water. 2. Once you are done with your regular cleansing routine, pour the mixture onto your hair and massage your scalp for a minute or two. 1. Dip a tea bag of green tea, black tea, or chamomile tea in boiling water. Once the decoction is formed, let it cool. 2. Pour it through your hair once you are done washing. 3. Rinse well, especially if you are using black tea as it is capable of discoloring light colored hair. After Holi, your hair is at its driest. All that colour seeps out its moisture, leaving it brittle, scraggly, and lifeless. So you need to pamper your hair promptly with some restorative hair packs, in order to deeply condition your dry locks, and give it the moisture it is craving! 1. 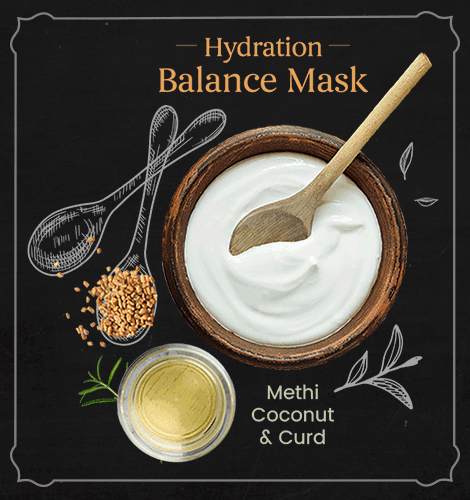 Soak 2 tablespoons of methi seeds for about two hours and then blend with 4 tablespoons curd and 1 tablespoon of Parachute Advansed Deep Conditioning Hot Oil. 2. Apply the pack on your scalp. Leave it on for about 30 minutes. Wash it off with a mild shampoo. 1. Lightly heat 2 table spoons of Parachute Advansed Deep Conditioning Hot Oil. Add 1 tablespoon of honey and stir well. Make sure the oil isn’t too hot. 2. Mash ½ a ripe avocado and add it to this mixture. 3. Apply it well all through your hair and leave it on for about 30 to 60 minutes. Wash it off thoroughly using a mild shampoo. With these timely hair care masks, your hair (and you) will get some much needed rest after the revelry. Bounce back to luscious locks, in no time! Giving it a proper wash and rinse, in time will bring back its lost lustre. Instead of a second wash, deep-condition your hair with home-made packs.